Getting an ideal haircut seems like a fairytale for many men. The same goes for a good beard cut. Paying for barber’s expertise may seem like a good idea at first, but with time, most guys realize that they are paying too much for not getting what they want. That’s why many beauty equipment manufacturers produce special hair care devices, such as clippers and trimmers to help men create what they want without any assistance. Clippers are somewhat different from trimmers because they usually allow a closer cut. The variety of such devices you’ll see on the store shelves is huge. Today, we’ll try to help you make the right choice by reviewing 8 Wahl hair clippers. Perhaps one of them is your dream tool. This high-quality clipper comes with all the necessary accessories to make clipping fast and enjoyable. It can be used both with and without a cord, making it a wonderful choice for the men on the go. It’s fairly lightweight and loaded with features. This nicely designed clipper with color-coded comb is easy to use. The battery is rechargeable with a 60-min runtime, making it easy to use on the road. The unit comes with 12 guide combs for a safe and clean cut. This quickly charging hair clipper operates both with a cord and without it. The 23-piece kit provides a variety of options for haircutting and hair clipping. It has two clippers: one for hair and one for the beard, making it an all-purpose tool for grooming. This is a sleekly designed clipper that comes with eight useful combs and a powerful battery. You can charge the clipper for 3 -4 hours and have it working for several days to come. The clipper is light and easy to use both on beard and hair. The blades are sharp, giving you a close shave. This is a high-quality clipper, which can be a great choice for men with short hair and beards. This easy-to-use professional Wahl clipper is multi-purpose. You can use it to cut your hair, mustache, beard and closely crop your neck hair. The color-coded brushes offer cutting length from 1/8’’ to 1’’. The unit is nicely designed, offers a good grip and a clean cut. It comes with 12 guide combs to make the clipping safer. This is a useful multi-purpose tool with a very appealing design and light weight. Even though it seems flimsier than Magic Clip, the good price compensates for the downside. This clipper kit seems to have everything you need for a good hair and beard trimming. It includes two clippers, a variety of combs, a cleaning brush, a storage case in more. The quick charging option allows you to charge the tool (big one) in just 15 minutes, after which it will run for two hours. This set seems to be made for professionals. It will take some time to understand how it works but once you do, it can be a real life savior. This model is very lightweight, making it easy to handle. It’s highly durable, making you feel as if it will last a lifetime. It’s intended for professional use but can definitely be used at home if you already have some clipper experience. The clipper can be used with a cord or without it. It includes 8 attachment combs, oil, brush, and blade guard for safe cutting. This maneuverable clipper is what you need when you are on the go or tend to forget to charge your gadgets. It’s small, light, and easy to use. This is the lightest professional Wahl clipper that we reviewed. It’s nicely designed and delivers excellent performance. This clipper is corded, meaning you can’t use it without a plug. However, this inconvenience is compensated by its precision, aesthetic appeal, and a powerful motor. The unit has a sharp blade and cutting guides from 1/8’’ to ½’’. This small unit is perfect for men, who plan to use it at home to cut hair and beard. It’s highly lightweight making it a good choice for lengthy clipping and trimming jobs. This is a powerful professional hair clipper, which can be a good choice for men, who are experienced clipper and trimmer users. The variety of combs and settings allows you to create all kinds of short haircuts and beard cuts. Even though it’s heavier than other Wahl models, it’s fast, safe, powerful, and stylish. This model is great for men who are looking for a professional and powerful tool for their haircutting. The unit is suitable for hair salon use. If you are looking for bald hairstyles, buzz cuts or fades, this professional clipper can get the job done. It’s precise, fast, and easy to handle. However, you need to be very careful in order to cut yourself. The titanium, self-sharpening blades can last for many years. This clipper is mostly recommended for salon use. However, you can easily use it at home for shaving your hair and beard. If you need a close hair or beard cut, this clipper is perfect. However, if you are not sure you can handle it, you had better get professional assistance. This reasonably priced model is a good choice for men, who are on a tight budget. It can be used both at home or at a salon. The self-sharpening blades ensure long-term operation. The guide comb has 6 adjustable positions making this clipper suitable for different hair and beard cuts. It comes with a handy travel bag to take the whole kit with you on a vacation or business trip. Unlike other clippers reviewed, this one comes with a nice 3-year warranty, which means the manufacturer is reasonably sure, the unit won’t break for at least three years. This is a wonderful model for the price you pay for it. Even though it lacks some power, it has all an average guy needs in a clipper. 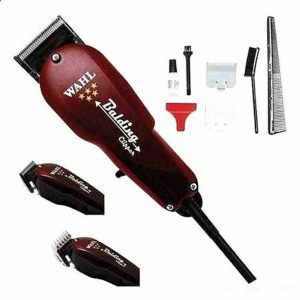 After reviewing over a dozen of Wahl clippers available on the market today, we believe that the best model is Wahl Professional 5-Star Cord/Cordless Magic Clip #8148. It’s suitable for both home and salon use, has corded and cordless options,looks stylish, and has many attachments. We would recommend this model to any man, regardless of his previous clipping experience. Before checking out all the hair clipper parameters, you need to figure out which ones are the most important. Corded or cordless? Cordless clippers are more convenient to use on the go while corded ones are usually more powerful. Is it well-designed? If you are buying clippers for professional purposes, it needs to fit into the hand well and weigh as little as possible. Sturdy or flimsy? Plastic hair clippers are usually cheaper, but they tend to break faster than steel ones. Battery power. If your clipper has an option of cordless operation, find out how long it takes to charge and how long it will work afterward. Self-sharpening blades? Models with self-sharpening blades last longer. Type of blades. Stainless steel blades are good and cheap, however, carbon or ceramic blades offer more precision. The number of comb attachments. The more attachments there are, the more choices you have when it comes to the hair length. Extra functions. Some clippers are not created just for hair. Many of them can be used for trimming your beard, nose or ear hair. Professional or not? Professional hair clippers offer more power and choices. Meanwhile, non-professional tools are cheaper and often more suitable for at home use. Here are a few tips we came up with while testing the clippers and talking to professional barbers. Always have your mirrors set up properly. You should be able to see around your head. If you are cutting someone else’s hair, make sure you are in a comfortable position. Being hunched for half an hour is hard on your back. Before starting the haircut, check if you have the right comb attachments. Clean your clipper with a special cleaning brush provided after each cutting session. Ask a friend or a family member to help you with your first haircutting session. If you don’t have any experience using the clippers, start with a simple undercut. Leave fades for later. Wait for the battery to lose its charge almost fully before recharging it. It will last longer. Q: Do I need a professional hair clipper for at home use? A: Professional hair clippers usually have many attachments and powerful motors. They also cost more. Most men need a very simple clipper to cut their hair/beards at home. Consider checking out a simpler model, especially if you don’t have experience. Q: Can I use the clipper to shape my beard? A: Not all clippers can be used for your beard. Check out the attachments and the blade guards. A beard may need an attachment different from your hair. A blade guard is necessary to avoid cuts. Most hair clippers are suitable for beards. Q: The sound changes as I operate the clipper. What is it? A: Most likely, you hear the motor cooling off. If when the sound changes, the clipper starts working improperly, you need to turn it off and contact a service center. You can also try to add lubrication. Q: How often should I oil the clipper? A: You need to oil it before each use. We hope these reviews have been helpful. Any of the above models can become your irreplaceable assistant. All of them have a necessary set of features for a quick, precise, and worry-free cut.